Wednesday, February 7, 2018 Thursday, March 29, 2018 John SnydersComments are off for this post. Note this is about a future release of APEX and the final release may differ from what I describe. As of this writing Application Express release 5.2 [Update: the release is renamed 18.1] is a work in progress but you can be an early adopter. Try it out and give us feedback. My experience working on APEX 5.2 has been quite different from 5.1. In the previous release I, along with a few others were laser focused on Interactive Grid. In contrast my work on 5.2 feels like a flood light shinning on many area, some not even identified during release planning. In this series of articles I give my perspective and some technical details on things that I have worked on. Lets start with Interactive Grid. The 5.2 release started with big plans for Interactive Grid (IG). We hoped to make substantial progress in our long term goal to make IG a supper set of Interactive Report (IR). It soon became apparent that other features such as REST services and REST enabled SQL, new Text with Autocomplete item, and page designer improvements would take resources away from IG work so we had to scale back. We kept the APEX community updated through conference presentations, and the statement of direction. The following is a Venn diagram that represents the feature sets of the IR and IG regions now, in 5.1, and in the imagined future. There isn’t much change for 5.2. 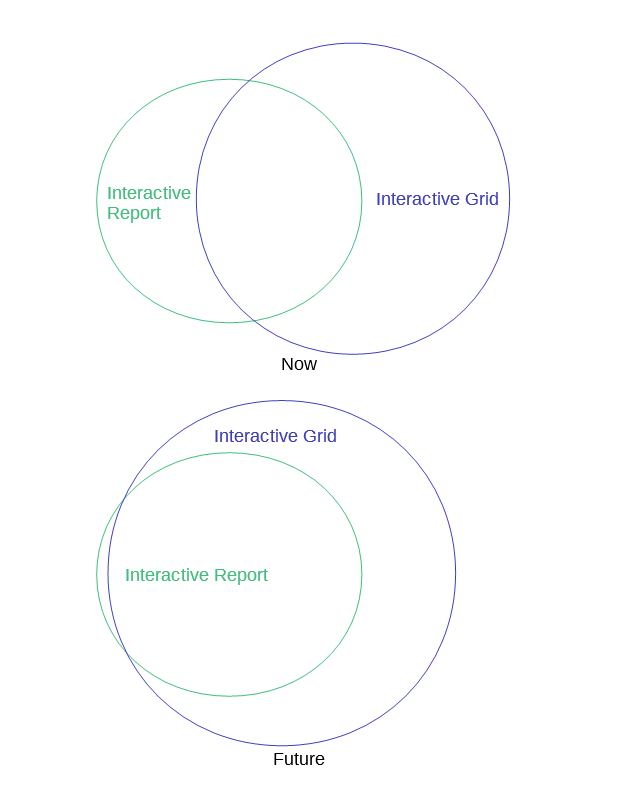 The only 5.2 features that increase the overlap between Interactive Grid and Interactive Report I had nothing to do with. They are JET Charts in IR, and URL based filtering and the PL/SQL APEX_IG API in IG. None of these are in the early adopter EA1. Hopefully they will be in EA2. The reason I left a small area of IR outside IG for the future in the above diagram is that there are some things, barely recognizable as features, that I doubt IG will ever do. This includes exact toolbar and menu layout, server side generation of markup, and browser auto table layout. With no one available to work on the IG back end I focused on a few front end only features, copy down and copy to clipboard. Both of these were requested by multiple customers. I think these features are easy to understand and use. I hope people like how they work. There has not been any feedback on them so far but there is still time to try it out and let us know what you think. Check the known issues first. Copy to clipboard and copy down provided strong motivation to have a cell range selection mode in IG. This was a fairly big change since the grid widget had always assumed whole rows would be selected. Once you could select a range of cells the ability to clear them or fill them with a value were easy bonus features to add. Some selection related bugs were also found and fixed. I have fixed a number of IG bugs and so have others. I expect that even more bugs will get fixed before the final 5.2 release. Another minor enhancement to look forward to in the next early adopter EA2 (or the final release) is end user and declarative control over the column width auto stretch feature. This is something a few people have expressed strong opinions about. I wrote about the issue before. The user will be able to decide if columns stretch by default or not and this will be stored with the report settings. Each column has a Stretch attribute that can either always stretch, never stretch or by default will follow the report setting. If you are currently using the views.grid.features.stretchColumns config option added in release 5.1.1 or the column option defaultGridColumnOptions.noStretch you will need to remove this code in order to take advantage of the new declarative attribute and report setting because the advanced IG and column config options have higher priority. In the next article I do a deep dive into the copy to clipboard feature. i think the cell selection by F8 key is too difficult to understand by end users. End users have Excel reflex. i understand that it would be a big challenge. because not all records of a grid might be rendered, I try to refere to the selectAll Checkbox. Any clue. how to read the current status of the header checkbox? Perhaps you could make it available in a future release.